A resourceful Rapunzel turns the tale askew. Employing the same cropped, shifty-eyed cover style as her previous work (Little Red, 2016), Woollvin hints at mischief right at the start. This time, a certain gal with long golden locks is not as helpless as she may appear. 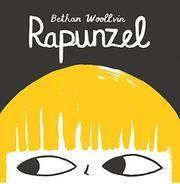 Woollvin begins with Rapunzel already in the tower; there’s no mention of how she got there. But a witch, in a modish black hooded dress that makes it look as though she’s wearing a black traffic cone, keeps her imprisoned. The fairy tale’s well-known refrain is only sounded once: “Rapunzel, Rapunzel, let down your hair!” but readers will appreciate the hint of familiarity. No prince is needed in this version; instead Rapunzel uses her own hair to climb out of the tower and makes friends with woodland creatures who help her escape. She defeats the witch with cunning ingenuity—and advice from a book titled How to Defeat Witches. The blocky gouache illustrations in gray and black, strategically accented with yellow (such as the witch’s bloomers as well as Rapunzel’s hair), heighten the timbre, suggesting both deviousness and joy. A damsel no more, Rapunzel dons a black Zorro mask and takes on the rest of the witches in the forest (all of whom are as white as Rapunzel, but one is delightfully bearded).